Roger Federer's stunning Wimbledon win has the tennis world purring, but his accomplishments on the court now demand ever-increasing respect across sports. His 19th grand slam title, coming after a difficult period where Novak Djokovic and Andy Murray took it in turns to dominate the men's circuit, has shown age is no barrier to achievement. Famed as well for his gentlemanly conduct, Federer's heady mix of tennis godhood and insane popularity mean he has reached an unprecedented level of achievement across any sport. Crucially, certain athletes' achievements stretch across the divide of sport, in the world of philanthropy, politics and social change, gilding what they accomplished in the playing arena with superhuman qualities. It is this mix that sees Federer assume the mantle of sport's greatest-ever athlete, ahead of some incredible hall-of-famers. Below is our top 10 of the all-time greatest athletes, across all sports and the gender divide. Some will say the likes of Serena Williams are often overlooked in the debate over 'greatest ever tennis player'. Certainly, the American has won more major titles across singles and doubles than Roger Federer, who has won no grand slam doubles events. But Federer's style of play, his rise to the top in one of the golden eras of men's singles tennis, his exemplary conduct and now his successful battle against age to reclaim his throne has seen him reach a rare air. A technically beautiful player that has been a massive drawcard since he turned professional, Federer has finally put his lean patch between 2012 and 2016 to bed, which saw age and mental gremlins seemingly take over as Djokovic and Murray assumed the world number one mantle. 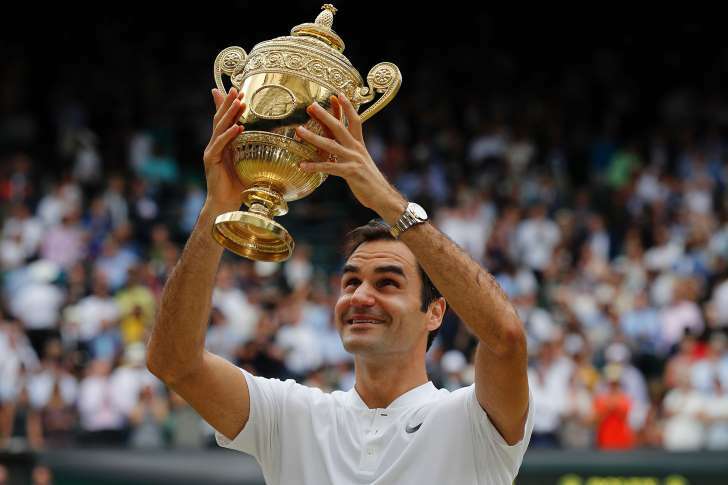 Now holding the record for most title wins by a male player at Wimbledon (his eighth title coming without dropping a set), Federer's legacy is ensconced, having dominated tennis's premier grand slam event. His philanthropic work, promoting education and sports in Africa, as well as donating to families affected by the 2011 Queensland floods, underlines another reason why he is so immensely popular world wide. But what ultimately rockets him up to the 'greatest athlete of all time' moniker is his latest victory. Conquering the age demon, and thanks in part to Djokovic and Murray's current stalling, he has resumed his old role as inarguably the best male player in the world at present. To do that at 35, when a few years ago we all thought he was pretty much toast, shows the real measure of the man.